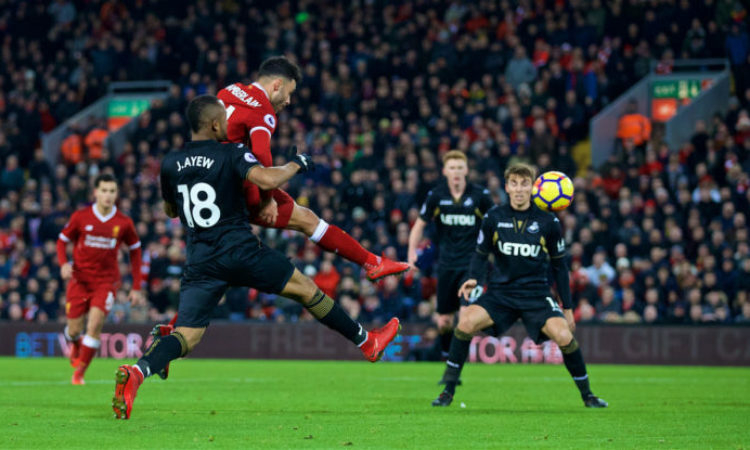 Roberto Firmino produced a man of the match performance,scoring twice,as Liverpool eased to a 5-0 victory over struggling Swansea at Anfield on Boxing Day. The Reds went on to produce a dominant performance after a brilliant strike from Brazilian midfielder,Philippe Coutinho, had given them the lead in the first half. Surprisingly, Jurgen Klopp’s side could not sustain their intensity to add more goals in the first half as Swansea went into the break just a goal down. The second half saw a more hungry Liverpool side, with more intensity to their pressing, pinning Swansea back in their own half. A burst of goals arrived with Firmino making it 2-0 in the 52nd minute before scoring again 14 minutes later, shortly after Trent Alexander-Arnold netted his first Premier League goal for the club. Alex Oxlade-Chamberlain then rounded off a comfortable win in the 82nd minute. The victory sees Liverpool move up to fourth in the Premier League, five points behind second-placed Manchester United, while managerless Swansea stay bottom of the table, five points from safety. Meanwhile Chelsea’s winning streak at Stamford Bridge reached its sixth game as the Blues produced a superb second half to ease past Brighton 2-0 on Boxing Day. The result keeps Chelsea in third place, a point below Manchester United, but they are still 13 points behind runaway league leaders Manchester City while Brighton sit 12th, four points above the drop. Chelsea were largely quiet in the opening 45 minutes with Blues attacking play lacking a cutting edge. The only notable scoring opportunity had fallen to Tiemoue Bakayoko who failed to score after being teeed up by Antonio Rudiger who jumped high to nod a cross down in the first period. But the second half saw a much more improved performance from last season’s Champions as they needed just 53 seconds to break down a stubborn Brighton defence. The combination of Cesar Azpilicueta and Morata linked up for the sixth time this season as the defender whipped a sensational ball from deep for the striker to nod home his 12th goal of the season. Alonso forced a brilliant save from Mathew Ryan on 57 minutes from a 25-yard free-kick but beat him four minutes later when Fabregas curled in a corner that was met by Alonso with a glancing header. Manchester United had it all to do in their boxing day fixture against Burnley at Old Trafford. England’s most successful club had to fight back from two goals to earn a rather unimpressive draw with substitute Jesse Lingard scoring twice to save them blushes. Ashley Barnes turned home as United failed to clear a Johann Berg Gudmundsson’s free-kick after three minutes, and Steven Defour made it 2-0 before half-time with a superb, curling free-kick from well outside the box. Half-time substitute Lingard missed a sitter from close range, before flicking home brilliantly to halve the deficit on the 53rd minute of the game. Lingard then drew United level in the first minute of stoppage time with a half-volley after what seemed like a handball had occurred in the build up to the goal. It however proved enough to earn a point for Jose Mourinho’s side and deny Burnley their first win at Old Trafford since 1962. The result means United, without a win in three in all competitions, are 12 points behind leaders Manchester City and just a point above Chelsea. City play on Wednesday against Newcastle.